Huge thanks to the CLASH patrons for joining us in our tour throughout Michigan beginning at the Brownstown Sports Center in Brownstown, MI! Additional thanks to the delicious food at our long-time sponsors Big League Brews — them burgers, wings, and beverages really hit the spot following a LIVE CLASH Wrestling extravaganza! * NOLAN def. “The Golden Gun” Mark Wheeler via pinfall. * Dragon Greed def. both Mitchel Hewitt & Freedom Ramsey in two separate singles contests, via pinfall. * RJ City def. The Mysterious Movado via pinfall. ** CLASH Champion “The Caveman” Elk announced participating in the 6-man tag main event, but was interrupted by “Undisputed King Of Status” Breyer Wellington. Breyer convinced Elk to be a defending champion by putting the gold on the line right then & there. * “The Caveman” Elk (c) def. “Undisputed King of Status” Breyer Wellington via pinfall to retain the CLASH Heavyweight Championship. * Mazerati Rick def. “Sin City Sparklin” Cameron Skyy via pinfall to become the new #1 contender for the CLASH Heavyweight Championship. * The LOTUS (Juntai & Gavin Quinn) and Petey Williams def. H3RD (“Mad Scientist” Tommy Treznik & Ded Vaughn) (c) and James Alexander via pinfall in a 6-Man Tag main event. 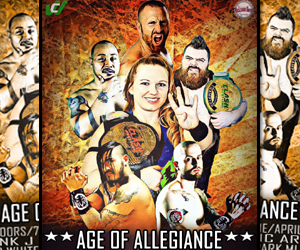 CLASH Wrestling returns on Saturday, 4/27 with #AgeOfAllegiance as our tour stops in Allen Park, MI. Details forthcoming here on CLASH Facebook!